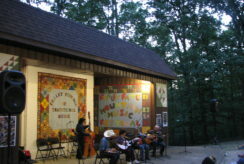 The Fraley Festival of Traditional Music is held every year at Carter Caves State Resort Park in eastern Kentucky. The festival began as a Fraley family reunion in the early 1970s but soon grew to encompass an extensive extended musical family. The festival attracts performers and music fans from across the United States to share music and swap stories. The annual event attracts champion fiddlers and top players, who share billing with those just learning. And some of the most important music making takes place away from the stage—at parking lot and campground jam sessions that go on day and night. The festival is now in it’s 4th decade. Annadeene Fraley passed away in 1996, and JP in 2011, but the unique musical gathering they founded is still going strong, reflecting their—and many others’—love of traditional music and desire to keep the sounds of the mountains alive for future generations. The festival has been held the first weekend after Labor Day since returning to Carter Caves in 1979. Here musicians gather from across the country to share in the concerts and workshops and to jam in the parking lot, the front porch of the lodge, all around the huge campground, and in the cabin area. What started forty years ago as a family event has grown to include a great many folks who may not be kin to the Fraleys but certainly consider themselves part of the family, proving that traditional music ties people together as nothing else can. Traditional music has been a part of the lives of JP and Annadeene since childhood. JP literally learned to play the fiddle at his father’s knee and, although he did not read music, his skill with the fiddle often led listeners to believe that he had formal instruction. Actually JP, the youngest of fourteen children, learned fiddle from his talented father, Richard Fraley, and the many fiddlers who lived in the surrounding area. Annadeene, daughter of a coal miner, taught herself to play guitar and was a regular on WCMI radio in Ashland, Kentucky when she was only thirteen years old. Her rich singing voice gave a warm feeling to a song whether it’s a ballad learned from her grandmother, a love song of Jim Reeves or Eddy Arnold, or a tune from her own pen. The Fraleys met while they were in high school and married following World War II. They have four grown children, all of whom have inherited musical talents. They performed often with their parents before moving on to their own adult lives. In 1971 when they started having this festival, Annadeene and JP had been playing together for many years at square dances and on radio and had begun playing at other festivals. They invited musicians to the Fraley Festival they had met through their participation in other festivals such as the American Folk Song Festival, Smithsonian Folk Festival, the National Folk Festival, Brandywine Folk Festival, Fiddler’s Grove, and many others. After their recording, Wild Rose of Mountain, was released in 1973, even more people throughout the country became aware of their special brand of music. The festival was created to have an opportunity to get together with the many good friends the Fraleys had met during their travels, allow people who didn’t get to play often to play on stage and preserve the rich heritage of mountain music. This makes for stage performances that have an interesting mix of more experienced and less experienced people playing. The audience gives encouragement to the less experienced and heaps praise on those more experienced musicians who play and entertain. The informality of it all along with encouragement from the audience makes it easy for people to get to know one another. Members of the audience and musicians look forward to seeing each other at the Fraley Festival and this gives the festival the feeling of a reunion each year. For many who play on stage, it is their first chance to play in front of other people. Some people who come to the Fraley Festival play on stage here and nowhere else. Somehow, the comfort level of playing on stage seems to be greater here than at other gatherings for these folks. The Fraleys value the talents of children and children have been encouraged to perform during the main stage programs. Many children have grown up playing on stage at the Fraley Festival and still do as adults to this day. Some musicians who have performed at the festival have been well-known such as Buddy Thomas, the Hotmud Family, Van Kidwell, John Hartford, and Mike Seeger. The family atmosphere makes the festival feel like a family gathering, not just by a few people but by practically everybody that comes to the festival. Annadeene worked to keep the stage performances informal, almost to where the audience feels like it’s sharing the stage with the performers. Doug Smith and Barb Kuhns, who manage the festival now, strive to maintain that feeling still. This contributes to the reunion atmosphere of it all. The music at the Fraley Festival has not been confined to any one type of music. Folk, old-time, western, western swing, early country, and others are played on a regular basis at the festival. There are all sorts of musical configurations from family bands or husband and wife duets to people playing on stage who just met each other a few minutes ago in the parking lot. Musicians and music lovers alike come as a loving tribute to Annadeene and J. P. and their efforts to preserve mountain music. 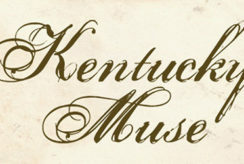 In the early 1990s the Eastern Kentucky Leadership Conference presented Annadeene and J. P. with the Cultural Arts Award for outstanding service to Eastern Kentucky. No one deserved it more. Folks who attend the Fraley Festival of Traditional Music take home a soul full of music and leave part of their hearts with everyone that they meet.